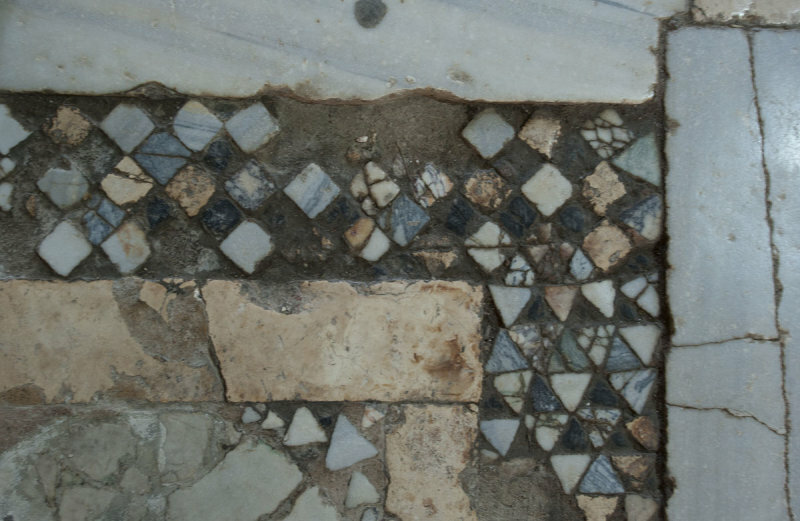 A detail of a marble ‘opus sectile’ mosaic pavement. Byzantine, 11th century. Opus sectile is an art technique popularized in the ancient Roman and medieval world where materials were cut and inlaid into walls and floors to make a picture or pattern. Common materials were marble, mother-of-pearl, and glass. The materials were cut in thin pieces, polished, then trimmed further according to a chosen pattern. Unlike tessellated mosaic techniques, where the placement of very small uniformly sized pieces forms a picture, opus sectile pieces are much larger and can be shaped to define large parts of the design. Source: Website of ‘stnicholascenter.org’ & Wikipedia.